Gerard Pique loves to rub it in when it comes to speaking about Real Madrid and Sergio Ramos, and he has done just that in his latest press conference following El Clasico win for Barcelona. Sergio Ramos lunged in to make a two-footed tackle on Messi in the 78th minute, and the referee had a straight red card to bestow upon the Real Madrid captain. 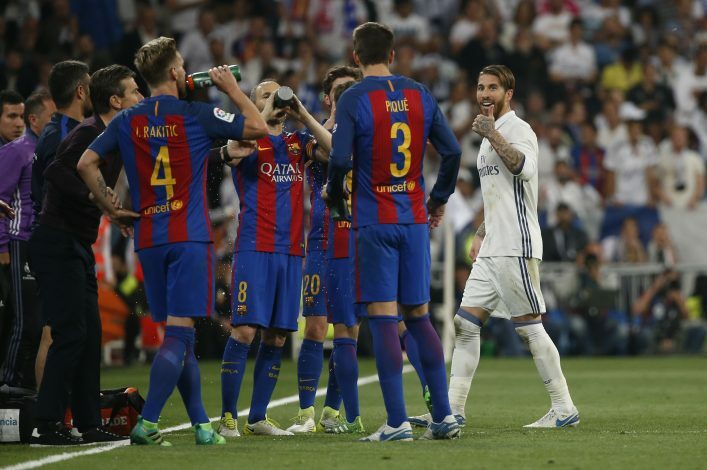 Ramos reacted angrily by flashing signs at Pique, who is known to be someone who doesn’t hold back, and nobody expected him to – after the red card situation in the El Clasico last night. “When Sergio Ramos gets home, he’ll regret for what he did. The red card is very clear, he goes with his two feet and Messi was clear on goal. In Santiago Bernabéu, they’re used to very lenient refereeing and when a referee does a good job he’s then the bad guy,” said a defiant Gerard Pique to the press. Pique’s jibe, in which he indicates that referees are lenient towards Real Madrid players, came after Casemiro, who was already on a yellow card for a first half foul on Messi, brought the Argentine down on three other occasions without getting punished. The referee Jose Hernandez Hernandez has invited some criticism for not giving Casemiro a second yellow card following a series of fouls by him. Casemiro was eventually substituted by Zidane, who sensed that a red card was not far away from the Brazilian midfielder. Last night’s loss to Barcelona has put Real Madrid in second place on goal difference, but Los Blancos still have a game in hand. Have Real Madrid just thrown away the title? Or was it just a blip? We will know soon.